I've spent a lot of time since I got back from Australia getting healthy. Eating very sensibly, lots of exercising, losing weight (it was the shots of me at the Sydney Opera House with my stomach bulging against the Kambriel waistcoat that did it. It brought home that even if my weight was only a little high, when you get into middle age, it's really not smart to let things get out of hand). I've moved from the tub of size 33 jeans in my closet to the tub of 32 jeans (32 jeans means my BMI is no longer where it shouldn't be), and today I noticed that the 31 jeans tub is filled with really nice jeans, most of which are almost unworn, so I've decided to get down to there, which is right in the weight-place I ought to be to make my doctor happy, and do my best to maintain it. Which is easy to do when I'm feeding myself, really hard to do on the road. Because it is February (when this blog was started) the Oracular Orb has, for the next 21 days, become me as a Swami. And for those of you who were wondering what the Orb is, or why it exists, it all started here: http://journal.neilgaiman.com/2007/02/now-we-are-six.html as a sixth birthday present from the blog. 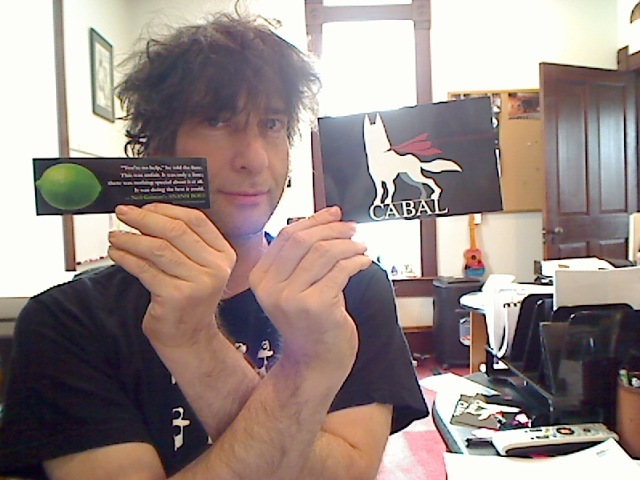 I took this photo for Cat Mihos, who sent me an "It was only a lime" sticker I thought was a bookmark and the Mighty Cabal sticker (which exists to support the Valley of the Kings animal sanctuary. 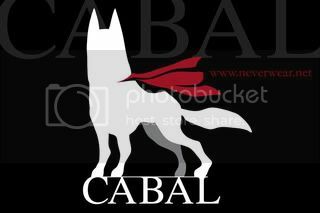 Cabal is doing a lot better. The vet took him off the drug regime he was on. He went onto the diet. And he's a lot better. A hundred percent better on the stuff that was scaring us (the not being able to get up, the cries of pain, the falling over) and about seventy-five percent better on the other stuff. And continuing to improve. So I'm posting this, mostly to spread the link and the information. And to say it worked for us. Sxip Shirey made the haunting music for Statuesque, the short wordless film I made starring Bill Nighy (Now available on DVD in the UK, Region 2 DVD format. I would have mentioned it here before, but I only just noticed.) He's brilliant. Sxip's band, The Luminescent Orchestrii, recently teamed up with the Carolina Chocolate Drops, to blend two very different types of music and make an EP. I saw this film of them creating art -- four minutes of the two bands talking, figuring out what they're going to be doing, four minutes of glorious music, and have decided it's just pure joy. I love playing it, love watching them while I listen. It feels magical, like something that will only happen once and we were lucky to catch it. Watch it. I'm not promising you'll like it -- the song starts at 4.00 -- but I think it's a very good bet that it will make you as happy as it made me. 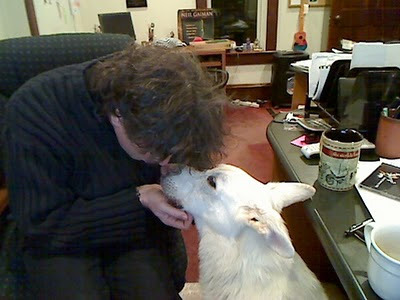 PS: We just added a page to the website, here at www.neilgaiman.com : http://www.neilgaiman.com/p/About_Neil/Patronage I'm Patron of the Open Rights Group and one of the Patrons (with Ursula K LeGuin and space scientist Professor David Southwood) of the Science Fiction Foundation.